Does anyone else ever find themselves traveling wayyyyyy back into their Instagram feeds to see what’s there? Sometimes for inspiration, sometimes out of curiosity, and other times because you have insomnia and wake up at 4:30 am? 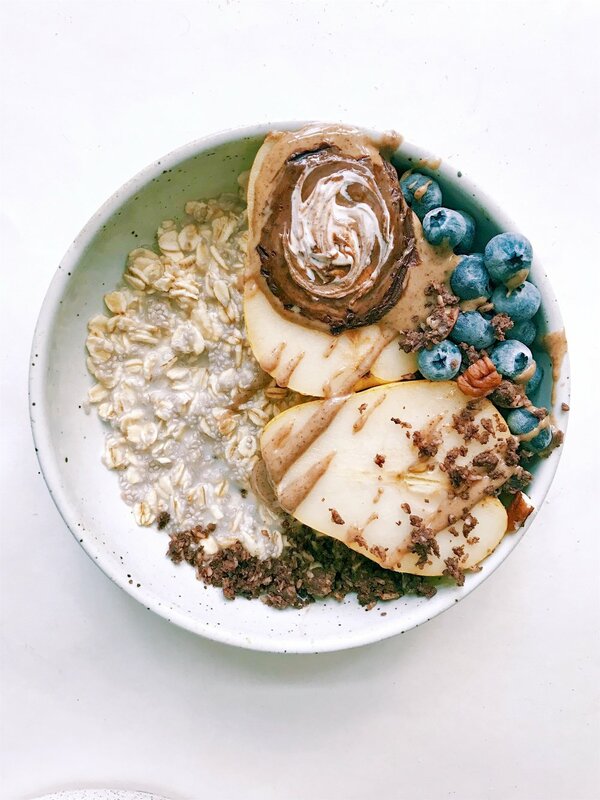 Well, let’s just say I engaged in all of the above this morning... and scrolled upon this bowl of chia oat porridge... with dark chocolate, coconut cookie crumbles, probiotic yogurt, a nice juicy pear, and plenty of nut butter. The bad news is, the cravings for this might eat me out of house and home. But the good news is, I did get to see the sunrise... and it brightened the grogginess right out of me. Add your oats, water and salt to a small pot, and bring to a boil over medium heat. Slowly add the almond milk and chia seeds, stir, and reduce to simmer over low heat. Stir your oats periodically, making sure they cook evenly and absorb the liquid. Once they start to develop a creamy, velvety texture (about 5-8 minutes), turn off the heat, add in your and cinnamon, and cover with a lid until you're ready to serve. Spoon your porridge into a bowl, add toppings and all the Pulp... season to taste, and devour!